Blank sheet labels are perfect for both personal and commercial applications. You can use them as decorations or to label your products in a fashionable manner. They can serve multifunctional purposes because you can easily stick them on any surface. With so many things you can do with blank sheet labels, it is one of those items that cannot be ignored, especially when you are running a business that needs to flourish. Why Opt for Blank Sheet Labels? Sheet labels are very versatile and they make great packaging labels, scrapbooking labels, office equipment labels, CD and media labels, shipping labels and more. By opting for blank labels, you will be able to print any design you desire on them at any time. Just imagine a scenario when you have ordered a large amount of printed labels and at the last minute, certain events render the current design obsolete and you have to come up with a new set of printed sheet labels fast. With this great alternative, you will never have to worry about such situations and can cut wastage to the minimum because you can print your design on the exact amount of labels you need. Order Your Blank Sheet Labels from Us! 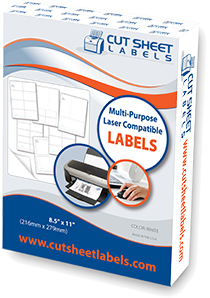 At Cut Sheet Labels, all of our sheet labels are laser and inkjet compatible! Not only that, we also pride ourselves on our excellent customer service, attention to detail, quick delivery, and most importantly, our remarkable pricing. You can have your blank sheet labels manufactured in different sizes. During the selection process, you will be able to choose from various materials as well as your required quantity. Whether you are using blank sheet labels for a quick labeling job in the office or decorating your classroom after you printed your own unique design on them, you can be sure that our products will work best for all your needs!